All people know that health care consists of good nutrition, regular sleep and exercises. However, exercises are very often neglected. Yes, people talk about the importance of an active lifestyle and necessity of everyday workout, but only some of them practice it. The main reasons of defiance are laziness, indiscipline, lack of time and underestimation of the importance of exercises. That is why, it is essential for everyone to realize top reasons to exercise regularly. The importance and health influence of such physical activities as weight bearing, aerobic training, and resistance exercise will for sure excite the curiosity of everyone. Cardiovascular system works harder within swimming, jogging, biking, soccer and basketball activities. The risk of heart diseases falls when blood is pumped quicker and in a larger amount. The plaques in arteries are built-up in lower manner within aerobic exercises. It increases the concentration of “good cholesterol”, high-density lipoprotein, and decreases the concentration of “bad cholesterol”, low-density lipoprotein. That is why, aerobic activities do not only increase general endurance of the body, but impact well on heart strength and cardiovascular system work. Running, rowing, biking and push-ups are the most common resistance exercises. However, jogging and walking train muscles well too. These kinds of physical activities aim to strengthen muscular and bone system of the body. A majority of people realize that push-ups build the muscles, but many do not know how important these exercises are for the prevention of osteoporosis and bone-weak disease. While we are weight-lifting, push-upping or doing repeated resistance exercises, our bones increase their density and preserve their mass. 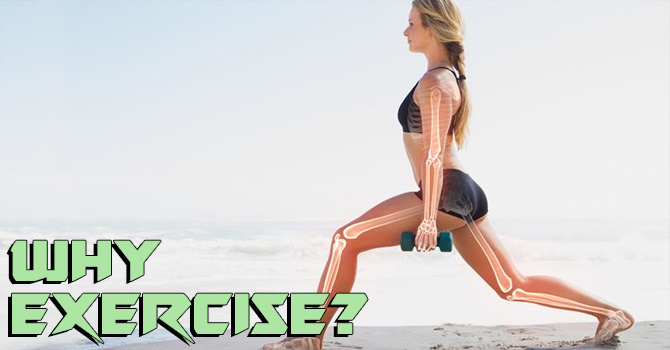 Thus, resistance exercises are as important for the muscles as for the bones of human body. All kinds of physical work outs are great instruments for weight control. Contemporary people do not work so hard physically as our ancestors did, but we have access to a bigger amount of food. The result is that we eat more calories than our body needs for everyday function. Thus, our body stores extra calories as excess fat. Who likes to be fat? No one likes and the cause is not only unattractive figure, but also poor health condition. Fat people are clumsy and slow. It is hard to call them “stayers” and very often, they have problems with cardio and bone systems. Consequently, all kinds of work outs will prevent you from obesity and will improve your health condition. While exercising, your body burns calories like fuel, but what is more amazing, it continues to do it for a few hours after you have finished your work out. It adds motivation, does not it? When you know substantial reasons to work out, it generates your motivation. Now, you should start. I recommend a slow move from the low periodicity and short-time trainings to higher and longer-time ones. Leslie Sansone’s or Jillian Michael’s work out videos will make you a great company. Enjoy your body and health in full! Build yourself!